From the catwalk to your home. 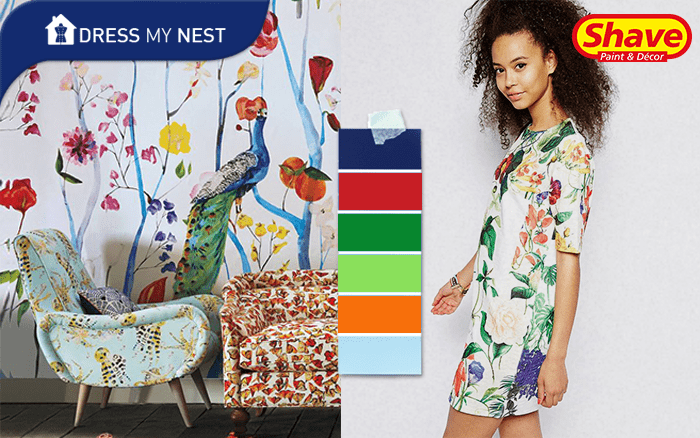 Recreate a favourite fashion trend in your home by using wallpaper. Botanical prints are all the rage, incorporating them into your home is so easy as it can help coordinate colours throughout the room, just like matching shoes & accessories to outfit. We recommend the following paint colours to create this look: Blue Jay (AC-4), Sunset Sari (CL-2) and Lime Juice (CL-8) from the Shave’s Colour Collection II and American Blue (8448-5) and Gloriosa (8216-5) from Dekade’s colour range.